Kate Humble and Professor Iain Stewart present live from Kilauea on Hawaii, the world's most active volcano. They broadcast from the edge of the summit crater. Kate Humble and Professor Iain Stewart present a four day journey into our extraordinary and dynamic planet, live from Kilauea on Hawaii, the world's most active volcano. They broadcast from the edge of the summit crater and the Halema'uma'u lava lake. 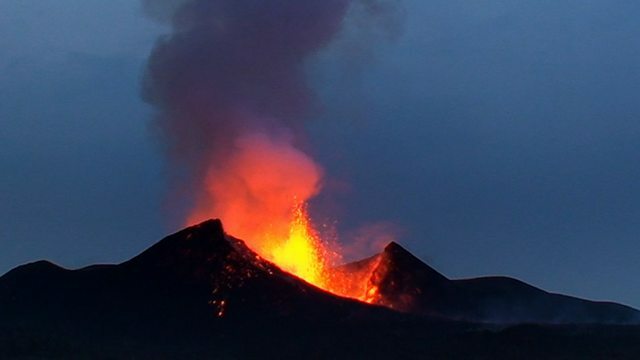 Kate also travels to Iceland to visit Eyjafyallajokull, the volcano which caused air traffic chaos in 2010, and comedian Ed Byrne heads to Bristol university to work out why different volcanoes erupt in different ways. Read our experts' answers to your lava-hot questions, plus exclusive news and photos. Webcams, blogs, videos and other extras from the Volcano Live team and across the BBC. Kate Humble visits Iceland, home of the Eyjafjallajökull eruptions in 2010.